As the temperatures here in Dallas begin to drop as fall sets in, it won’t be long until we see many wild animals like squirrels looking for warm shelter from the cold. What better place than your attic? Squirrels love the protection from the elements that your attic provides, as well as the secluded privacy and wealth of nesting materials available. While squirrels are an important part of the Dallas ecosystem, they have no place in your home. 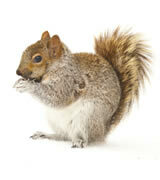 Noise – When a squirrel enters your attic, the scratching and squeaking noises are often impossible to ignore. Their naturally social nature also means that if there are multiple squirrels in your attic, you’re likely to hear them chatting up a storm above your head. Damage – Squirrels need a way to come and go from your attic, so they often open up existing holes or cracks to let themselves in, damaging your home. These holes make your home prone to water damage and can cause your energy bills to increase. These critters also have a tendency to rip up insulation and chew on electrical wires, creating a fire hazard that can put you and your family in danger. If you suspect that squirrels have infiltrated your attic, they likely won’t leave until you make them. This is where Critter Control® of Dallas can help. Our squirrel removal experts are trained and experienced in humanely removing these nuisance critters, as well as cleaning up and repairing any damage they may have caused. Call Critter Control® of Dallas today with any questions or to schedule your free home estimate.